The exciting and athletic sport of Equestrian Vaulting is said to be able to trace its roots back to the ancient Roman games where acrobats would perform daring routines atop their steeds, entertaining the royalty of the time. Others attribute this daring sport to the ancient Cretans and bull-leaping, which would see participants leap over bulls using the animals horns to vault and perform somersaults and other acrobatic tricks and stunts. Either w ay, Equestrian Vaulting has which is often described as choreographed acrobatics on horseback and has been in existence for at least two thousand years. Graceful and talented competitors compete in both compulsory and freestyle categories and have the option to compete as a Solo (Individual), Pas de Deux (Duo) or as a Team. With the average vaulting horse standing approximately 1.6-metre – from the ground to the base of their neck, it’s not a height you would want to fall from – making it breathtaking, thrilling and an utterly graceful sport for spectators to watch. The vaulting horse moves in a 15-metre diameter circle, directed by a lunger who stands in the middle. Competitors are required to complete seven compulsory exercises which include: basic seating, the mount, flag, mill, scissors, flank, and stand, with each exercise being judged and scored on a scale from 0 to 10. Interestingly horses are also judged and receive a score based on the quality of their movement and behavior in the ring, meaning Equestrian Vaulting is as much about the riders as it is the beautiful horses. Equestrian Vaulting is a fairly unknown sport in South Africa but is widely popular in Europe and the USA. In South Africa, it is governed by VASA (Vaulting Association of South Africa) and is a discipline that falls under the SAEF (South African Equestrian Federation). 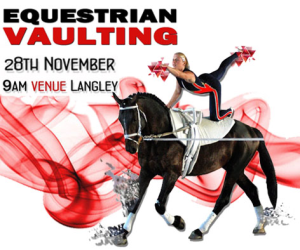 The Equestrian Vaulting Kwa-Zulu Natal Championships take place on the 28th of November 2015 at the Langley Equestrian Centre, 25 Pauline Crescent, Summerveld. Entry is free for spectators and you can be assured of a fantastic day out with entertainment for the whole family.